…because this one comes from a fan of a rival AFC North team! Bengals fan and MU alum Dan Plettner not only had the opportunity to attend the Hall of Fame Induction Dinner last Saturday, but also the opportunity to meet and chat with Big Ben. 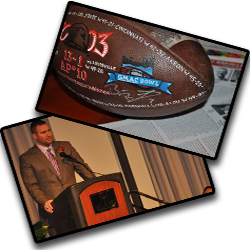 I had a splendid experience at Ben Roethlisberger’s Miami University Hall of Fame Induction Dinner on Saturday evening. 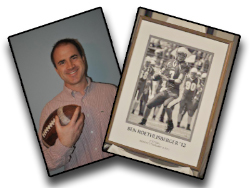 Ben was inducted alongside his posthumous coach, Terry Hoeppner. Ben’s emotions and words were a great tribute to Coach Hoeppner. I had brought a football for which I frankly am still working toward a decent historical knowledge. I went up to Ben shortly before dinner and told him I had something I thought he might like to see. He smiled immediately as he saw the Redhawks logo on the ball’s finish and then he began examining the ball pretty closely. I am still uncertain whether the football was actually used in practice and/or games… and whether it was definitively ever touched by Ben in 2003, but I loved the ball 10 times more the moment Ben remarked about the ball to the effect, “this ball has a lot of history.” Another former player at the event informed that the ball was a new model/style in ’03. I enjoyed a normal conversation with “Big Ben” and he seemed to find my challenge of being a proud Miami alum simultaneous with being a Bengals fan pretty humorous. After talking, when I informed him that I’d be honored if he choose to sign the ball he graciously reached for my pen and took his time to choose a place to autograph it. After thanking him, I felt like a little kid and discretely walked the football around the perimeter of the room (rather than taking a direct route back to my table) so as not to “open the floodgates” for others to approach and ask for his autograph just before the dinner commenced. Later, listening to the speeches from Ben (which truely honored Terry Hoeppner) and Terry’s wife really fully made me appreciate my good fortune for observing a special night in the history at Miami University. It also helped me to appreciate Ben on a level different from the one seen by most – the player on the field. Ben showcased humor as a nice compliment to heartfelt emotions, even joking about a fictitious “Brian” who had been accidentally introduced (instead of Ben). My grandparents were Miami alumni before myself. My youngest son (2) literally went all the way to Oxford for his first ever sporting event. We bought and display a (Miami BB alum) Wally Szczerbiak game-used Timberwolves jersey in our living room. If I ever had the opportunity, I’d love to do the same to memorialize our pride in Ben. You can only imagine the frustration I felt when the Giants failed to draft Ben. I then knew my fears would be realized and that our Bengals were in an unfortunate division for Ben’s pro career. It has been wicked at times to have adopted the Steelers as a second team. Ben, if you ever happen to read this: thank you for helping me to cherish your contribution to Miami University Athletics. *Dan, thank you very much! You can see a close-up of the football that Ben signed, as well as a few photos and comments from others who were in attendance at the event, here. Photos from the event can be seen here (pages 1 & 2). Also a BIG thank you to Steelers fans Sam Nicklow and Rebecca L. Miller for their contributions to this post!